← Do You Know What You Know? Buzzing cicadas, whose mouthparts reek of root juice. A Requiem for a shoe: a shabby wingtip with broken ties ….lying on its side in the byway … becomes, somehow holy. A teacher singing show tunes and weeping in a middle school classroom, filling empty space with melody, another period/full of lyrics; accidents. These images and snatches of experience, have been resonating in my mind, calling out to me, reflecting parts of myself, and connecting me to someone else’s story, passion, or singular beating hope. I spent evenings this past summer in the company of a small group of local writers. Mainly younger than I, they are part of what I like to think of as “the hip scene of Topeka creative life”- that outpouring of energy among young artists, musicians, writers, thinkers, and entrepreneurs of the past five or six years. We meet after hours at the Blue Planet Café to drink coffee and munch the cookies the owner leaves for her writers. The Topeka Writers Workshop was founded three years ago by Leah Sewell, who facilitates it as well. Leah gently leads us in writing exercises and the workshop model of critique. I joined the group because I wanted to get out of a box and mix it up with people different from me around a passion we share in common, good writing. The group turned out to be mostly poets. At first I was afraid to tell them I am poet too, having written and published poetry since I was ten or so. But these were real poets, serious poets, the kind, who say they are addicted to poetry and take big risks for it. One is a PhD candidate in creative writing, another is an MFA candidate. Besides, what I was bringing to the workshop was prose, chapters from a book I have been revising forever. Yet I need to confess that poetry is in my blood. 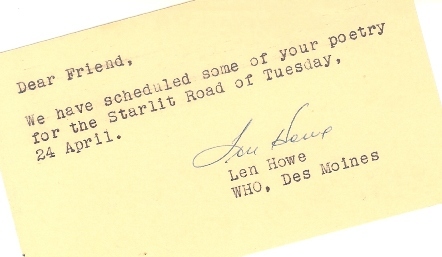 I remember gathering with my family around the radio in the evenings to listen to Len Howe read mom’s poems, broadcast from WHO radio in Des Moines, Iowa. I recently found in her files a sheaf of postcards dating back to 1948 from the radio station telling her when her poems would be read on the show Starlit Road. Over 79 of her poems were read, some more than once. In the kitchen mom often stopped mid task to grab a towel, wipe her hands, and scratch out a line of poetry on the back of an envelope. I recall her urgency to get a phrase or image written before it went down the drain with the dishwater. Sometimes I sat on a chair while she ironed and read aloud from the first poetry book she owned, Untermeyer’s Modern American and British Poetry, (1928). I loved Edna St Vincent Millay, Robert Frost, and Walter De La Mere. Only much later would I learn of mother’s inner struggle between longing to be a poet and the demands of wife and mother. When she asked the poet, Paul Engle, why through the ages only men had become great writers, he told her, “Women simply do not have the stamina for rigorous creative arts. It happens in all the other arts as well as writing.” He went on to say that great writing required the writer to suffer great tragedy which apparently the obtuse fellow assumed only came to men. I never took a creative writing class. I skirted around the edges of poetry, deciding to perform it rather than create it. My undergraduate and M.A. degrees were in speech and theatre with a minor in English. I only began to claim being a writer in my mid thirties. I don’t think this fits here. It’s good, but use it elsewhere, says one. This is contemplative. You pose a question and then approach and answer in different ways, notes another, getting what I am up to. its gloss in my palm. and bow away from its pointing eye. grips my face, tells me to get inside. Each member brings poems which stun me with their beauty, jolt me with clarity, slap me with surprise, intrigue and invite me into the warm mystery of another human being. And I like it that they are not churchy. Trust the reader more, they tell me. (Don’t preach.) Let us make the connections. (Don’t patronize.) Let us have our own meaning. (Don’t proselytize.) We are open and welcoming, but please don’t write like the kind of Christian, we were afraid you might be, when you first joined the group. Like hound dogs, they sniff out my defensiveness, my need to please, and expose my vulnerability. They confront me with my own prejudices and what it means to write about God and even use the J word (Jesus) in a culture where the word, Christian, makes many people, including me sometimes, squirm. Flannery O’Connor called poetry the accurate naming of the things of God. Taking their cue from the great southern writer, these poets simply inspire me to write poems, to trim away the fat, to consider just what I am trying to accomplish here, and cast off all self consciousness. They make me more contemplative and honest. I am interested in communion, that co-union of minds and hearts, that bridges the isolation and the apparent inadmissible truths between us, where we find a home, if only for a moment or two, in one another. I found it with these poets, reaching beyond their isolation with the things that seem important to them. If you are looking for a home, a little clarity for yourself, and some good entertainment, come to the Blue Planet Café on Friday evening, September 21 from 6:00-8:00 pm for Topeka Writers Workshop READS. Be there to listen and meet these writers. I think you will fall in love too. 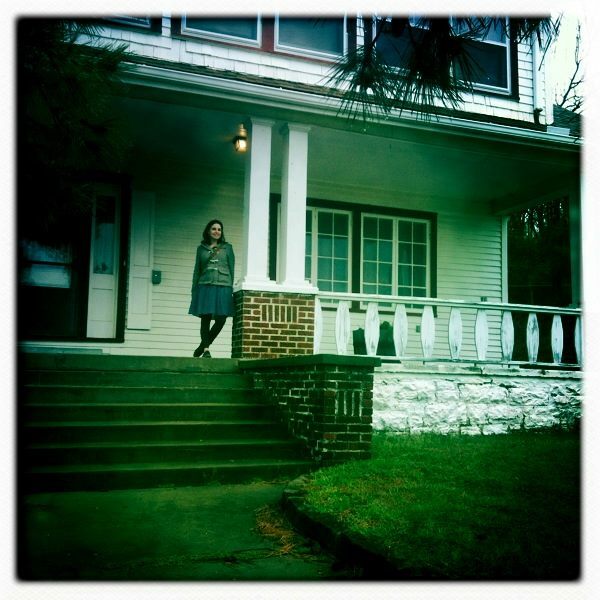 Leah Sewell is a poet, book designer, magazine editor and MFA candidate at the University of Nebraska. She is a past recipient of the Association for Women in Communications Women Making Headlines Award in media and the Penwomen Scholar Award for Letters. 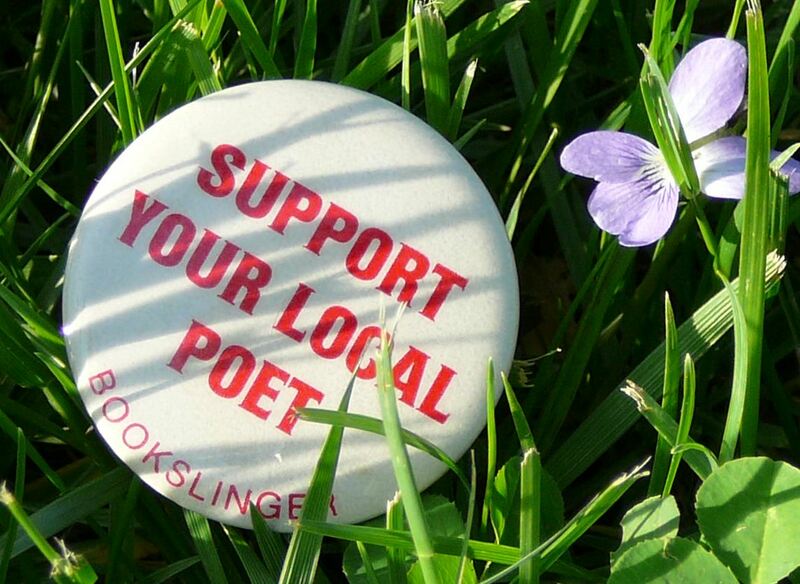 Her poems have or are expected to appear in PANK Magazine, Midwestern Gothic, Roufus City Review, Weave Magazine and Begin Again: 150 Kansas Poems. She is the founder and facilitator of the Topeka Writers Workshop in Topeka, Kansas where she lives with her family. This entry was posted in Christianity, contemplation, KS, spirituality, Topeka and tagged art, Arts in Kansas, Christianity, contemplation, Paul Engle, poetry, Poets, Topeka Writers Workshop, writing. Bookmark the permalink. For but by the Grace of God you have been given these Gifts as He shaped and sculpted you the artist even before you were born and these gifts were meant to be shared and as you open inner self to others as they open their inner selves to you prose from Him flows through and out of you into others and in turn stanzas, sketches, and shapings from them flow into you. And as the poetry, music, pictures and sculptures intertwine the art becomes one a singular unique collage to which each contributes exposing a fragment of his most private inner soul lingerings. In the doing each is set free if only for the brief encounter as the expression of the collage completes the circle from God through his people and back to God. “Art washes away from the soul the dust of everyday life.” – Pablo Picasso. Beautiful Melancie! Thank you so much for your gifts. lots of love! This was such a sweet, wonderful blog entry! It has been a real honor to be in a writing group with you, Loretta. Ben, you are not only a really good writer, but also a born teacher. And I loved your story about the French professor and the young anarchist! Beautiful as usual, Loretta. Thank you! You are such a loyal and supportive reader. Your comments and likes mean a lot and keep my going. I still hope our paths cross again sometime. I remember that discernment process we did in Nashville. Wow… so much has happened for you since then. Blessings!